I wouldn’t consider myself a morning person, I could sleep for many more hours than I do. I try to get between 7-8 hours each night, but I could definitely go for about 10. Lately, I’ve been trying to be better about my health — both physically and mentally, and one step I’ve been trying to master is my morning routine. A few months back, I was sleeping until about 7:15, when I have to be out the door by 7:30 — and having to take my dog for a walk before I leave. I was rocking the messy-bun on a daily basis, and it left me feeling exhausted, rushed, and frustrated. I thought that by hitting snooze several times, and giving myself a few extra minutes would be beneficial – how wrong I was! In recent weeks, I’ve switched up my schedule. I have still been leaving at 7:30, but now I wake up at 6:15. A whole extra hour! And it makes me so. much. happier. 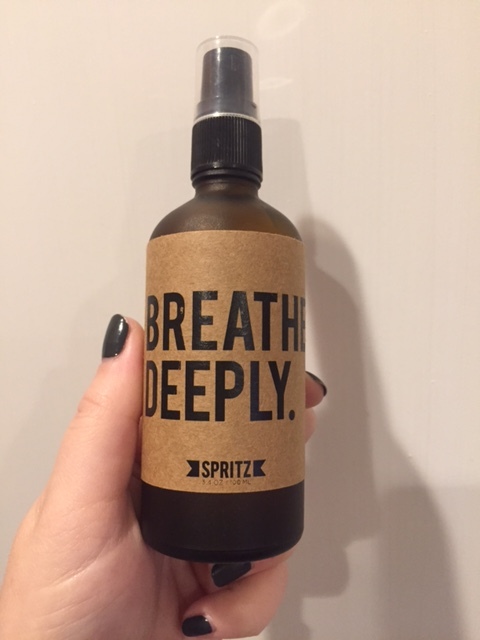 I wake up, and spray this “Breathe Deeply” Happy Spritz right in my face (it’s a mix of pure peppermint + eucalyptus + 100% pure essential oils). It is a wake-up call, and also my reminder for the day to BREATHE. Often when I’m stressed, I’ll find myself literally holding my breathe. It’s so bad to do – and I’m making a conscious effort to knock that off. Next, I’ll get up, make some coffee and have a glass of water. I’ll take Cooper out for a nice, longer walk rather than rushing her, too. Then I get ready, maybe even do my hair if I feel like it since I now have the time. After I am ready for the day, I make a healthy breakfast and actually sit down at our breakfast table and eat it. It’s amazing having time in the morning and not being stressed. My morning and whole day are so much better with my new routine in place. It is still a little difficult to get out of bed, but now I look forward to my time in the morning, so I’m willing to get up and do it. I look forward to the weekends to sleeping in a bit, but my weekdays have improved greatly.